Before eloping, I thought it would be good to bring my soon-to-be husband to my hometown. I’m from a small lake town in the extreme northwestern part of Wisconsin, near the Minnesota state line. Speaking about the quirks and characters of Lake Nebagamon doesn’t do it justice. It is a town that needs to be experienced to be understood. This was evidenced while I was giving my future groom an extended tour of my childhood home in which he noticed what he assumed was your standard growth chart. The assumption was fair. He was, after all, looking at pencil marks on an unfinished doorframe in the basement, though they didn’t track the physical progress of my two sisters and me. Instead, they compose a list by year and points (the number of protrusions from the base antler of a deer that are at least one inch in length) of all the deer my father has shot since 1989, the year I was born. I have never known an existence that did not include eating venison. That’s the cultural norm in rural Wisconsin—the same state that eliminated a minimum age requirement for hunting. But venison’s history with America is as old as the country itself. As Field & Stream articulated, “From the beginning, venison made America. Back in the day, if you wanted to eat, you ate a highly processed form of acorns and persimmons and chestnuts and Greenbrier. You ate the very fabric of the forest. You ate deer.” This venison consumption was out of necessity and convenience, of course. Settlers striving to survive were met with an abundance of readily available game and they took advantage of it. Centuries later, though, venison still has much to offer. 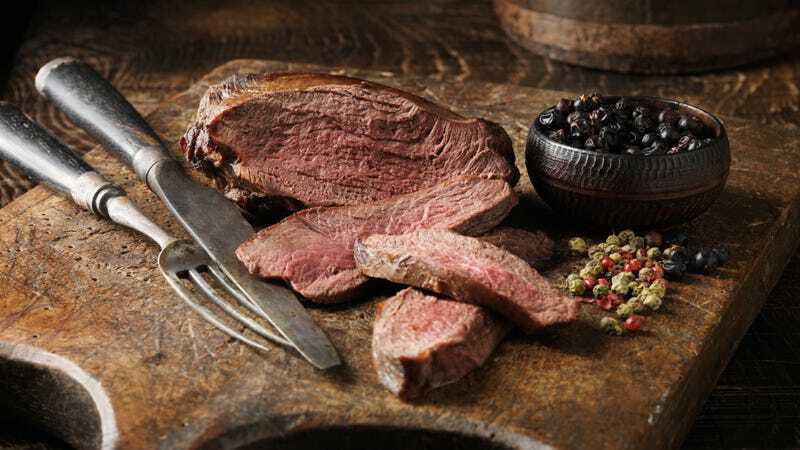 It has the highest protein and lowest cholesterol content of any major meats. And as The Takeout’s Kate Bernot noted, “an adult deer can yield 150-plus pounds of lean, hormone- and antibiotic-free meat, the kind of game you’d pay top dollar for in a restaurant or butcher shop.” Yet it remains just outside the mainstream meal plan for most of America. One of the few notable attempts to popularize it and capitalize on it comes from Arby’s, which in October announced it would carry venison sandwiches—though I wouldn’t suggest one begin there. Instead, allow this Upper Wisconsinite to steer you into deer—not in a car, that’s foolish—with three levels of venison-consumption depending on adventurousness and ambition. Any sort of dehydrated or cured product will be the most accessible form of venison available. Because venison is a very lean, neutral-tasting meat, it makes for an ideal protein to turn into jerky. (Plus, after it’s dried and salted, jerky has a long shelf life, which makes it an easy way for venison neophytes to wade in the deer pool.) I’m a fan of the venison jerky from Mountain American Jerky, the Colorado-based jerky purveyor who not only offers standard beef jerky, but more exotic meats such as elk and kangaroo. And of course, venison. The same can be said about snack sticks. The ones you find in checkout aisles, not so good. The real deal will have just enough simple salt-and-pepper seasoning to have you coming back for more. I would also suggest going for the smoked version—what little fat venison contains will absorb the hardwood smoke, which makes the meat more pronounced, and I think, delicious. Summer sausage is really any sausage that can be kept without refrigeration until opened. As with a lot of sausages, it’s usually made from leftover scrap and organ meat that would otherwise be wasted. Growing up, I was most familiar with a mixture of venison, pork, curing salt, pepper, garlic powder, onion salt, and mustard seed—and I would eat slabs of it with sharp cheddar cheese. It’s great for traveling and can be packed for a picnic, a camping, or hiking trip, yet it’s versatile enough that it would be right at home on your charcuterie board where the presentation is a little more refined. And as with any sausage, it’s easy to spice things up. Take, for example, Louie’s Finer Meats’ Minnesota Summer Sausage, which includes the addition of wild rice and blueberries or their Wisconsin Summer Sausage with cheddar cheese, cranberries, maple syrup, and honey added to it. As a proud Minnesconsin dweller, I suggest you order both. The first time I made a taco in a bag on my own (I’m nothing if not a chef), I was disgusted with how runny the meat was and couldn’t figure out what I did wrong. I had browned the meat and stirred in the taco seasoning like always, but for some reason, it came out looking like it had already been digested. It was some time before I realized that I needed to drain the ground beef, something I had never had to do with the leaner venison I was used to using at home. And for that reason alone, I find it to be a superior substitute for most ground beef-based cooking. Buy some online and start making chili, meatballs, meatloaf, tater tot hot dish, sloppy joes, you name it. More specifically, if you’re willing to take that venison and put some work behind it, may I suggest making venison bacon. I never took to the bacon craze that overtook menus for a while, and I blame this on venison bacon, which is by far the superior bacon. In comparison to that fatty flimsy bacon that becomes a crispy stick once cooked, venison bacon is half venison and half pork and usually has half the amount of fat and cholesterol as regular bacon. It’s also heartier and can compete on the same level as breakfast sausage or ham in its substantialness. Made by packing the ground and seasoned meat mixture into a baking sheet before placing it in a smoker, it is a cured meat treat. So the catch here is that unless you live in an area where you can buy venison bacon outright, you’re going to have to go back to the ground venison and make this yourself. It’s worth it. For the uninitiated, cooking such a lean meat properly can be difficult. It takes some finesse and usually some added fat to create a meal that is comparable in texture and taste to what you’re more accustomed to. The leanest cut of the deer is the filet, which sits on the spinal column, getting the least amount of work so the muscle naturally breaks down. Translation: It’s incredibly tender. And, venison filet is not gamey—it’s delicate, like a hybrid of veal and pork. If you’re cooking with venison filet, know that it’s a small cut and easy to dry out. Wrapping it in bacon and lightly searing it (you shouldn’t cook it above a medium-rare) will help. However you cook it, expect a lean, clean-tasting, satisfying cut of Americana.